effective way to get rid of fleas." The active ingredient in Program Flea Control is an "insect development inhibitor," or IDI, called lufenuron. It works by inhibiting the development of flea eggs laid by adult female fleas. This is a very effective long-term flea control method, as it interrupts the flea life cycle and prevents flea infestations. Unfortunately, this means that the flea must first bite your cat before the IDI gets into the flea's system and works! It takes about 21 days for the lufenuron in your cat's blood level to be high enough to start killing fleas. You may continue to see fleas for 30 to 60 days beyond your cat or kitten's first dosage of Program Flea Control. If you already have a flea infestation, you'll need to take other flea control steps to get rid of the existing adult fleas. This is particularly important if your cat suffers from flea allergies. You can reduce the number of adult fleas with natural flea control methods, such as flea combing your cat and washing all areas where fleas may be. You may also want to use an adult flea insecticide until you eliminate the flea infestation and the Program starts to take effect. Program is best used as a preventative measure against fleas on your cat. Start using it before flea season in your area to prevent flea infestations. This flea medication can be given to your cat either orally or by injection. If injected, Program will last for six months. It can be given orally to your cat or kitten in tablet or liquid form with food. If you use the tablets or liquid, you must do this every month with a regular meal. Watch your cat carefully to make sure that she ingests the whole dosage. You can break up the tablet if it makes it easier for your cat to consume the whole thing. The dosage will depend on your cat or kitten's weight. Read the manufacturer's instructions to make sure you give your cat the right dosage. If you are giving Program to more than one cat, dose them separately to make sure that they all get the proper amount. Because Program Flea Control for cats does not kill adult fleas, it's important to treat all the animals in your house to prevent flea infestations. You may also need to use a flea insecticide to kill the adult fleas in your home until the Program has had time to interrupt the flea life cycle. Killing the adult fleas as quickly as possible may be particularly important if you have kittens (to prevent anemia) or if your cat suffers from flea allergies (caused by the saliva from a flea bite). Plus, fleas carry tapeworm, so you want to get them away from your cat as soon as possible. 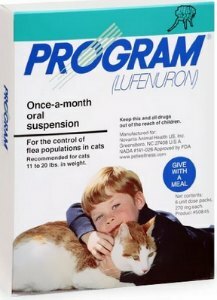 Program can be used in kittens six weeks and older. If you have dogs in your home, be sure to give them Program made specifically for dogs. If any of these symptoms occur, it's best to discontinue use and consult with your veterinarian. Program is now available without a prescription. You can buy Program directly from many pet supplies stores and online. Amazon carries this medication as well as all other popular conventional flea control meds. Make sure you choose the right size for your kitty's weight. Only Natural Pet Store is my#1 recommendation for natural flea control products. If you decide to go natural, this is the place to go.